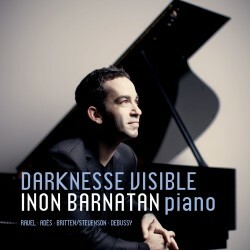 The brilliant Israeli pianist Inon Barnatan debuts on Avie with Darknesse Visible, an album of colourful and atmospheric masterpieces by French composers Ravel and Debussy, and Englishmen Thomas Adès and Ronald Stevenson. Inspired by the title track, Adès’ Darknesse Visible – a wondrous and dreamlike prism on the John Dowland song In Darkness Let Me Dwell – Inon chose works that are linked by different characteristics of darkness in the music, and all inspired by literature. Ravel’s inspiration for Gaspard de la Nuit was the gothic, haunting quality of Aloysius Bertrand’s poetry, while La Valse builds in intensity and works itself into a satanic frenzy. At the heart of Debussy’s Suite Bergamasque is the enchanting Clair de Lune, whose masked figures of the Verlaine poem of the same name dance in the moonlight. Ronald Stevenson’s compelling fantasy on themes from Peter Grimes brings out the dark side of human nature as explored in Britten’s celebrated opera. Trained at the Royal Academy of Music in London and now resident in New York City, Inon Barnatan has gained an international reputation for engaging and communicative performances that pair insightful interpretation with impeccable technique. He performs a diverse range of repertoire and is equally valued as a concerto soloist, recitalist and chamber musician. Inon has performed with the Israel Philharmonic Orchestra, Netherlands Chamber Orchestra, Orchestre de la Suisse Romande, and toured with the Academy of St. Martin in the Fields. In North America he has had performed with the Cleveland Orchestra, Houston, Philadelphia and San Francisco Symphonies, and at Carnegie Hall, the Metropolitan Museum and Alice Tully Hall, and is a regular collaborator with the Chamber Music Society of Lincoln Center. In 2009, he was awarded the Avery Fisher Career Grant.